With summer break nearly upon us, I’ve started thinking about how to structure our summer. Actually, if I’m being honest, I’ve been thinking about this for months and may or may not have a couple excel spreadsheets dedicated to The Plan – ironically, it’s all in an attempt to reinforce my old school philosophy that neither I nor the TV should have to entertain my kids every second of the summer. In order to help with this, we have a very long Boredom Buster sheet tacked to the fridge so if they throw me the I’m Bored line, I don’t even have to make eye contact, I can just point to the Boredom Buster list for consultation. Part of our daily routine in the summer is reading. 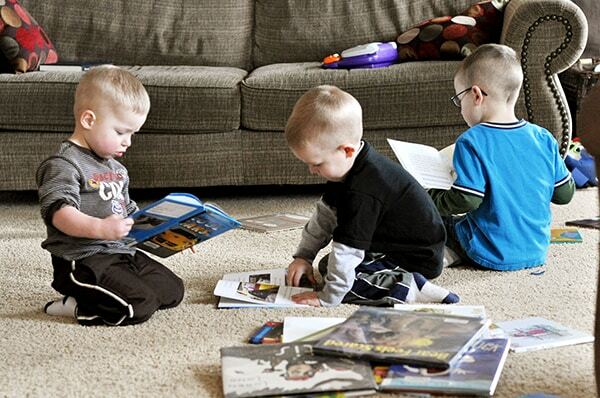 As in, the kids reading to themselves or reading to a younger sibling. We always have a read-aloud chapter book that Brian or I read to the kids many nights before bedtime, but summer daily reading is meant to be independent; additionally, the books have to be approved through me in an attempt to inspire the kids to read good, quality literature (as opposed to them reading Captain Underpants for months on end, no offense, Captain). 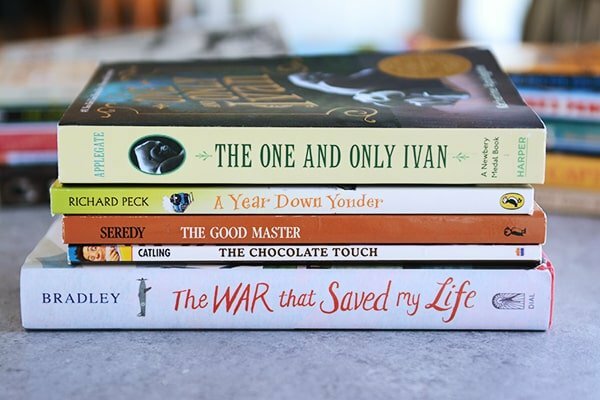 For today’s post, the kids helped me gather a few books that are their current favorites in case you are in the same boat we are. I could bore you with about 100 more suggestions (we have sooooo many books), but these are a good start (and I included a few honorable mentions below the post). I’ve linked to the books on Amazon or other online sources for an easy place to grab a synopsis and reading level – but of course, search your local library first (and don’t be afraid to ask if the librarian can request or get a book for you if they don’t have it at your library currently). 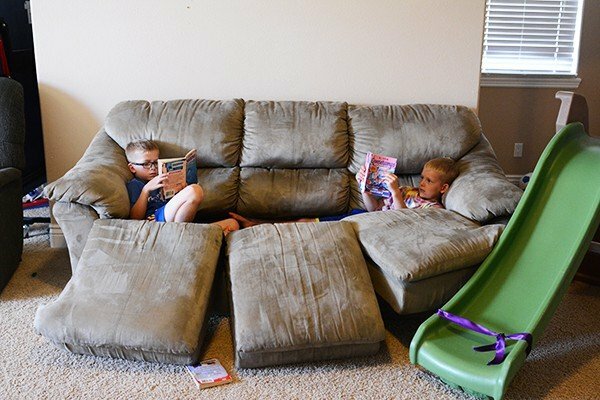 Normally, I don’t really keep track of how many books the kids read in the summer (they don’t have to write it down on a list) unless they are doing a summer reading challenge through the library, mostly because each of my kids read at different paces and levels and I don’t want it to be a competition. I genuinely want them to develop a love of reading really good books, even if it takes them a while to get through a book. When they finish a book, they bring it to me and we talk about it for a bit – I ask them some questions so I can check reading comprehension, and they tell me the parts they liked and disliked. This summer, they are actually earning points to “pay” for a pass to a local waterpark since homeschooling this last semester meant they missed out on that chance at public school. Each book they choose has a point value (and can differ by age; for instance, Mr. Popper’s Penguins would be 8 points for my 7-year old but only 2 points for my 12-year old) and they have to earn 100 points (maybe 200 for the older kids) in order to earn a pass to the waterpark. 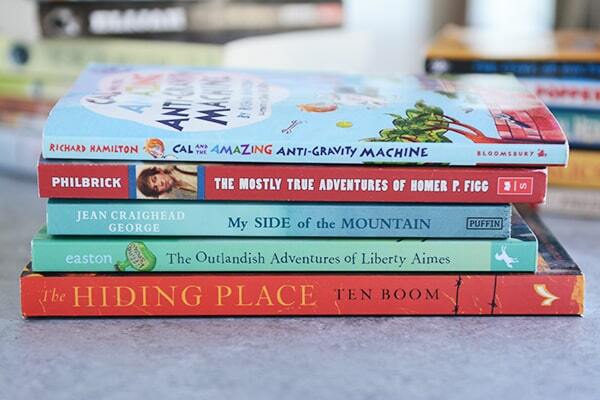 All the books listed below are geared toward kids who are reading chapter books at some level; my independent readers are ages 7, 8, 10, and 12. Disclaimer: I have read all these books and feel comfortable with my children reading them (at various ages) but because everyone has a different gauge for book appropriateness, I can’t guarantee you’ll feel the same. Please read through them before buying or before having children you know read them. Update: since many of you asked, here’s the Boredom Busters sheet I have for my kids; it’s constantly changing as I take things off and add different ideas, and you can see, it’s tailored to activities and supplies (and pets 🙂 we have around our house, but hopefully it can be a starting place to get your own list going. Share any of your own book recommendations in the comments! This”s really a nice list. I had took a lot of time to found some books for my childs this summer. I will note this. Thanks a lot! A favorite activity at our house is painting rocks from outside. My kids have started to make a jungle by making all of the animals out of rocks. Thanks for the book recommendations and opening the discussion so I could get some summer reading ideas. I have a 12 year old boy that I really need to inspire to read. Growing up in a house of girls, it’s been harder for me to find books that he likes. We did read a youth version of Unbroken and he loved it. Both versions are so well written, full of historical facts and inspiring. I agree with your other commenters about Harry Potter series, Rick Riordan books and Number the stars, Gail Carson Levine books- especially The Princessses of Bamarre and Shannon Hale’s- The Goose Girl. I also read all of the Lucy Maud Montgomery books and they are all wonderful. My 9 year old son did The Oregon Battle of the books this year. The books were great! Dan Gutman’s- Genius Files was a favorite among our all boy team. I would recommend his other books, too. Also, they loved the Imaginary Veternarian series by Suzanne Selfors. A Long Walk to Water is true story about the Lost boys in Sudan. It is inspiring, but for the older children because several people die in the book. Lastly, for the younger children is an out of print series, called The Value Tales. Each book teaches a value through e story of a historical person- Jackie Robinson, Eleanor Roosevelt, Louis Pasteur, etc. A Year Down Yonder!!! We highly recommend that one too!!! Many on your list we have read too! Thanks for sharing! My kids (ages 6-10) have also really enjoyed the Jake Maddox series of books. They are all sport based (boy and girl) and reinforce how the main character overcomes an obstacle by doing the right thing. My kids have also really enjoyed Escape from Mr. Lemoncello’s Library and his other books. Those books are full of riddles that make them think. Please include me in any email you write about your homeschooling experience! I am a new homeschooler and love so many things about it, but I’m still searching for the best way to do things. I love hearing the experiences of others, because I feel that is where I learn the most. For example, how on earth do you find the time to cook such yummy things and update this website while still being a mom AND homeschooling. Being a homeschool mom seems like a full time job to me! You must share your secret! The Newbery books are a great place to start, especially the books that have won in the last 20 or 30 years. Shannon Hale writes some fun books for younger readers. Have your older boys read Brandon Sanderson? I find him really entertaining even as an adult. He’s LDS and teaches at BYU, so I don’t worry as much about language or content. I just finished the Steelheart series which is a great twist on super hero stories. I could make recommendations forever, but those are some of the most recent ones I’ve read. Thanks for all your recommendations. 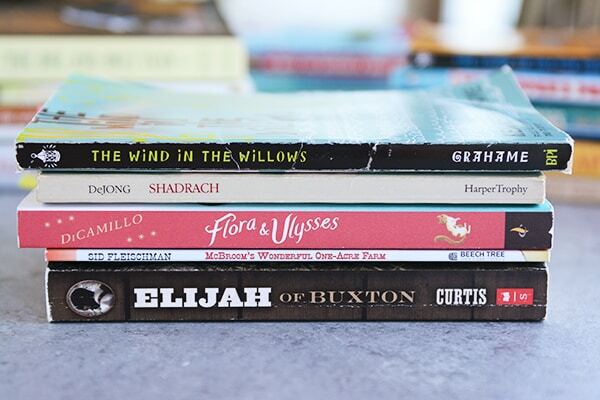 I’d love to hear what books you read aloud to your kids. My mom homeschooled us and that was a part of every school day, reading aloud to us. I read so many of these as a kid and recently! I remember loving the Mrs. Piggle-Wiggle series and the Betsy series (Betsy’s Busy Summer, Betsy’s Little Star). I personally am hoping to reread the Little House series soon, I haven’t read it since I was a kid (and I’m too impatient to wait for my 3 year to be old enough for it). I love books…..consequently my 4 daughters love books….THANK YOU so much for posting this, I know the world is filled with good books but what I would choose isn’t always what my kids like and I get tired of the wasteful fluff that’s everywhere that they blow through in 60 minutes. QUALITY literature is priceless….thanks again for sharing your awesomeness. There are hundreds of others, of course, but these are the ones that come to mind at the moment. Great list of books – I also enjoyed all the books added in the comments. I love to get recommendations. I collect and send books to families living overseas, many don’t have access to libraries or bookstores. To add to the list, I would recommend a few multicultural books that help children relate to what it would be like to live in other parts of the world: I love Mitali Perkins books: Rickshaw Girl and Tiger Boy (India and Bangladesh (for ages 8-12), The Wheel on the School by DeJong (Netherlands), Anna Hibiscus by Atinuke (Africa), The Single Shard and The Kite Fighters by Linda Sue Park (Korea), The Red Pencil by Pinkney (Sudan) to name a few. Also there are some great books about refugees and immigrants such as Home of the Brave by Applegate, Inside out and Back Again by Lai, or Jar of Dreams by Uchida. I just finished homeschooling for 23 years, 4 kids kindergarten through high school. Funny how I thought I’d just do kindergarten and see how it went, but all of a sudden I was done and they were grown! My boys loved the Ralph Moody Little Britches series, we did it as a read a loud, and they never wanted me to quit! And truthfully, I’d sometimes read ahead after they went to bed because I wanted to know what happened:). Good luck with your homeschooling decision- it’s an exhausting undertaking! I was going to suggest the Little Britches series as well – kind of like Little House on the Prairie for boys. Great stories with adventure, humor, and wonderful life lessons. Thanks for the great recommendations and the boredom busters! My kids have really loved The BFG by Roald Dahl. We do a bored jar – popsicle sticks with activities (and some of them have chores – ooh, what a gamble!). If I hear the kids say “I’m bored”, they have to draw a stick and do the activity. My kids get overwhelmed by a big list and just think they don’t want to do anything since they are in a funk. I love “The Hiding Place”! I love that it made your list! Mel, I’ve taught elementary, middle school, and now high school English–and have loved them all. At the elementary level, one of my all-time favorite books is The Phantom Tollbooth. This is a book built on puns with much wit and creativity. A great book for titles and brief synopses is Jim Trelease’s Read Aloud Handbook. I think he even has a second book. And now that you are homeschooling, I highly recommend Mosaic of Thought, a book for teachers that explains the reading strategies proficient readers use. Very useful to understand both for one’s own reading as well as opening these seemingly “locked doors” of comprehension to students. All the recs from others are spot on—fantastic titles. Oh, and any books by Roald Dahl are superb; he is my favorite author. Phantom Tollboth is wonderful. Even if they don’t get all the puns, the adventure of the story is entertaining and thought provoking. We agree with many of the above-mentioned books! I could go on too long…. We did a whole school year theme called the Magical Kingdom of Books, where were read books that went with the lands at Disneyland (Science fiction like 20,000 Leagues Under the Sea for Tomorrowland, and Little Britches, Tom Sawyer, and westerns with Frontierland, fairy tales for Fantasyland). My boys were 6 and 8 and it was so much fun! Thank you so much!! I love this list! We love My Father’s Dragon, The Indian in the Cupboard, Mrs. Piggle Wiggle, and Encyclopedia Brown (fun to read together and discuss what we think the answer is before finding out. I bet your boys would love that, too). You already mentioned The Lightning Thief, and my 10 year old daughter absolutely LOVED all of the Percy Jackson books. After finishing Percy Jackson, she moved on to the Heroes of Olympus series and the Demigod Diaries. Now she wants to go visit Greece and Rome! I love it when kids get hooked on reading! Totally have a notebook with my summer plans for my kids- cooking schedule, job charts, etc. And we’ve had a boredom buster sheet tacked to our wall for years. It could use an update though so thanks for sharing! Thanks for this! I have a book lover in my 7 year old and am constantly looking for ideas on books that would be age appropriate and interesting. I like that you say you’ve read them all first to determine your comfort level — I’m having a hard time with that as she reads 2-3 a day! You’ve encouraged me keep interacting with her and these new books she’s reading. Loved that u included the link for Everyday Reading, Mel. I have just taken notes on this blogger’s personal list of favs for a gal’s own summer reading. (She had me at Orphan Train & the pic of her on the chaise lounge! This is wonderful! I have used many suggestions from your gift lists in the past, as our families are similar in size and age. (two boys, 10 and 8, three girls, 6,4 and 1). I am planning to request many of these titles from our library for the Summer. Also, I second the comment above, I would LOVE to see your “Boredom Buster” list. I imagine many of your ideas would be well received around here. My boys liked the I Survived series by Tarshis. Also would you en willing to share your boredom buster list? That sounds like exactly what I need. Can you copy and paste the email you sent her and send it to me? I would love to hear about that too!! Maybe make a a page like you had with running. Homeschooling moms could chime in with what they have learned/why they decided to do it. Everybody has very different reasons for doing it but the goal is same: what is best for the kids. I think people would really be surprised as to how diverse homeschooling families are. Thanks so much for the list of your favorite books. I have some crazy readers that have read some of these but there are some that we haven’t read yet. Will you share your “boredom buster” list? I also want to have a plan as we go into summer vacation but I fail at getting it together. I can use all the help I can get! I’m a mom of 4 boys ages 13-4. Recommendations from us: My 13 yr old has just finished all 5 Francis Tucket books by Gary Paulsen. 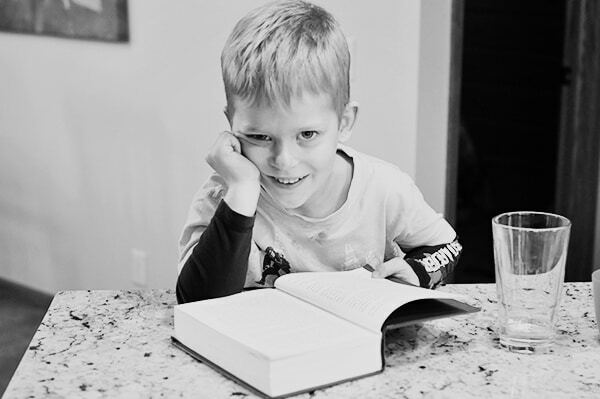 The last thing he would choose to do is read, but these books have REALLY captured him…in fact he has stayed up late reading which is soooo rare. The order of the books goes: 1-Mr. Tucket 2-Call Me Francis Tucket 3-Tucket’s Ride 4-Tucket’s Gold 5-Tucket’s Home. A couple other of his favorites are Call It Courage by Armstrong Sperry and Hatchet by Gary Paulsen. My 11 year old likes all books by Brandon Mull. He’s stayed up till the wee hours of the morning just recently finishing the newest 5 Kingdoms book. It’s the 4th in a series with more to come. His absolute FAVORITE series was Fablehaven. 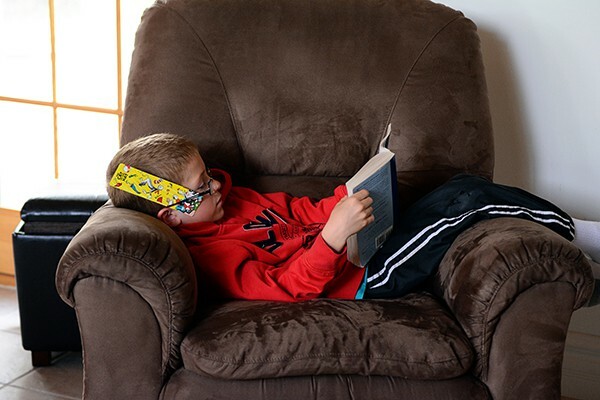 Unfortunately, I can’t get him to read anything but Brandon Mull so he waits for the next book in the series to come out before he will read anything else. Ugh. My 7 year old is loving the Boxcar Children series right now. He also just LOVES the picture book Roxaboxen by Alice McLerran. He wants to make his own “Roxaboxen town” this summer. This is a book I really enjoy reading over and over. It is such an imaginative book and in making his own Roxaboxen town this summer will provide hours and hours of play. And as for my 4 year old, his favorites at the moment are Sand Cake by Frank Asch, The Gingerbread Man Loose in the School by Laura Murray. I love picture books (my weakness) and I love reading all of the Little Critter books! They are sooo funny and so close to real life! In the past with my older boys some one of their favorite book series where I’ve read to them was the Dragon Slayers Academy series. They’ve also just loved The Witches by Rohld Dahl and Summer of the Monkeys by Wilson Rawls- We’ve just laughed and laughed reading that one. The Mouse and the Motorcycle is another favorite by Beverly Cleary. I would love to hear YOUR favorites that you read in all of your “downtime” haha! Great post! I love the reading for waterpark pass idea! Does the park out that on, or do you buy it after your boys have read to enough points? Such a good idea. I love Laura Ingalls Wilder books, too, Kendra! I’m just doing the waterpark thing on my own – but our local public schools do it for the kids during the year. If they read enough books, they get a free pass. My kids missed out on it this year because of homeschooling. Thanks for the recommendation for the website! My 10 year old loves the Harry Potter books and the Land of Stories series by Chris Colfer. She liked the Thea Stilton books when she was younger. My 8 year old enjoys the Magic Tree House books and Geronimo Stilton. They both love listening to the Chronicles of Narnia as read alouds. We love listening to the Chronicles of Narnia on audiobook, too! I haven’t heard of the Chris Colfer book, thank you! Oh Mel, so happy to hear you are homeschooling!!! I always wondered about that as you *seemed* like the kind of mom who would prefer that for her kids. Yay!! Welcome to the club!! One book that we are halfway through is “Sweet Home Alaska.” It’s historical fiction (chapter book) about the aftermath of the depression and how families were part of a lottery to move to Alaska and start a colony there. Very interesting, tons to discuss. It’s been compared to the Little House books. I think there are lots of us on here who would listen to you:) Please do a post about it. Pros, cons, why you chose to do it, etc. I, too, would love to hear how you ended up homeschooling. I use your recipes often, and just made Creamy Swiss Cheese Chicken Bake tonight. I was literally just searching Pinterest for this exact thing!!! Thank you so much!! I don’t give money for chores or grades but I definitely bribe for reading. Love the water park pass idea! Hard with boys but deep down they are starting to like it. Thanks so much!! 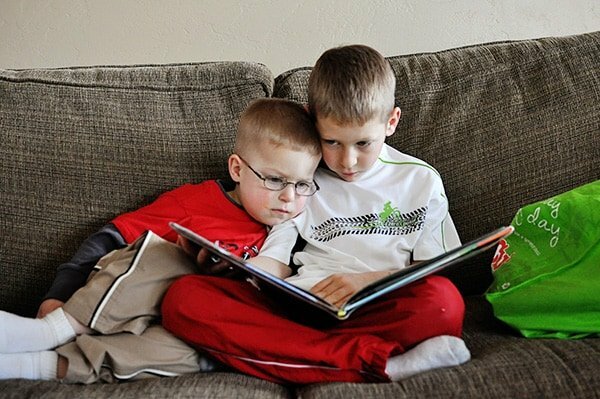 I agree, Leslie – it’s been a process for my boys to love reading for sure! Thank you for this list! I just picked a couple books for my 9 year olds to read this summer and then downloaded a reading guide activity pack from Teachers Pay Teachers. They are going to read Rain Reign and The Thing About Georgie. I just read The War that Saved my Life and I loved every bit! Have you read Echo? If not, you should definitely get it! It was an amazing book! I’m glad these are supposed to be recommendations for children but I’m talking about how much I love them! I’ve been into reading children’s books lately! Counting by 7’s was adorable too! Thanks for the recommendations, Heather! Echo amazing. If you ever do audio books, I really recommend this one as there is a musical theme that is played out beautifully on the audio book. Your kids are the perfect age for the Mysterious Benedict Society series by Trenton Lee Stewart. They were on the New York Times best sellers list and they do not disappoint! They are full of mind-bending brain teasers and surprises. My boys still talk about those books. In fact, they are reading it their sister now, just because they want to read the books again! Oh, fun! I’ll definitely be checking them out. I’m an old fogey at 60 (nearly 61 – gah!) but was read to and read and still read (no TV). All to preface, what about some oldies like Tom Sawyer, any of the Jules Verne books- are they too tame now? Cam is still too young but the 9 year old daughter of a co-worker is loving and devouring the Anne of Green Gables books. My brother and I read the Horatio Hornblower books at maybe 10-12 and thought them adventurous – and they sparked my own continued interest in Historical Fiction which has helped me learn and retain more about history than actual history classes. I know I’m “preaching to the choir” here but the love of reading fosters so much that is helpful in life. Happy reading to everyone of every age! Thanks, Liz! Preach away! I can’t wait for Cam to get ready for Anne of Green Gables (my favorite book series of all time, I think). I tried it on my boys but it wasn’t a good fit. 🙂 I’m going to look into the Horatio Hornblower books for the kids, thank you! Oo! So many good ones! 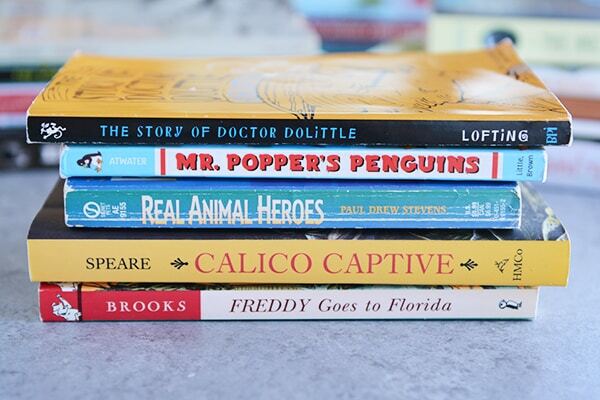 Mr Poppin’s penguins is a favorite from my childhood, and I’ve always loved Dr Dolittle. My oldest is 5, so not an independent reader, but she loves chapter books, so we’re always looking for new ones to read together. I love E. Nesbit (haven’t read Railway Children though!) But if your kids like her, they should read Edward Eager’s books. Half Magic is a great one to start with. Thanks, Kat! I’ll look into the Edward Eager books. Great list, I’m excited to read some of these myself let alone my kids! My 12 year old is a voracious reader but I struggle with my 10 year old. He did love the Lemonade Stand series and we are working through The Series of Unfortunate Events by Lemony Snicket as our night time reading together. I enjoy this serious as much as he does! I’ve tried to get the boys to read Lemony Snicket but they haven’t given it a chance – I think that’s a good idea…we’ll read it aloud together! I taught 6th grade for 12 years so I have a list a mile long–but these have been current favorites at my house in the last year or two. Oh, and my 8 year old Harry Potter lover would add that series to your list, and also the Candy Shop War series! This is a great list Mel. I’m still a few years away from these books (board book life over here ). Would you mind sharing some of your favorite adult books sometime? I trust your opinion . I’ll get a list together, Karen, and maybe share it when I’m really brave. Reading is so personal (don’t you think?). I remember sharing one of my favorite books of all time with a friend and she hated it (and was horrified that I liked it) and I hate to admit it but I kind of took it personally (silly to think of now). I’ve always been a little gun shy since then to share recommendations that I’ve loved so much. But…I like recommendations for others so maybe it’s time to get brave again. Don’t worry Mel I won’t hold you responsible for any book I don’t like. You’ve saved my dinner plans enough to have a lifetime of goodwill. In my reading career I’ve seen everything. Books I recommended that were a big dud, books that came highly recommended that were flops, and books I expected to hate that I unexpectedly loved. Oh I love a good summer reading list, thanks for posting these suggestions. Amd I swear we would be friends in real life…a boredom buster spreadsheet is SO something I would do!! 😉 I would love to see that list as well! 🙂 Just updated the post with it. Thanks, Amy! We are reading Wonder aloud as a family; it’s such a great book for kids to talk about. I love the book Wonder!! I was laughing one page, and ugly crying the next! I can’t wait for my kids to be old enough for that one! Make sure you read her supplement chapters after “Wonder.” She has at least 3 out now “The Julian Chapter,” “pluto,” and “Shingaling.” Each of these will make you love Wonder even more. I think you can only get them on Kindle. I was delighted to see The Good Master, by Kate Seredy on your list. That and the sequel were two of my very favorites when I was a child, and my soon-to-be high school graduate daughter loved them as well. Unless you are homeschooling your kids, it might be a good idea to get a list of books from your school as to what books they read in the different grades. Many times I plan to read a book with my students and several of them have already read it. The kids (and sometimes the parents) don’t want to have to read it again. This is amazing!! I am totally writing this list down!! Have to chime in that all of Brandon Mulls books are total winners in my family. Along with John Flanagan’s ranger series. I’m sure your older boys have read all of them already. Such great books! I just read Flora and Ulysses (and laughed the whole time) and The War That Saved My Life is probably my favorite book I read last year. Another really good book (actually small series) for that age is Chasing Vermeer by Blue Bullitt. It’s a great little mystery with intermittent pictures that house a secret code of their own. “Chasing Vermeer” was also a favorite at our house. Blue Balliet also wrote “The Calder Game” and “The Wright 3”. These books encouraged my kids to learn more about each of these artists and I think I remember a few art projects being made. These would be great summer reading. All fantastic books! Especially love Holes and Ella Enchanted. That second picture of your boys on the couch is just killing me! Partly because your little guy looks sooo much like my son did at that age but also because they look like great friends, which make me so happy. Good luck with your summer reading; I remember how hard summers could be when they were little. Thank you so much! Excited for some new books for my 8 year old book lover. I would LOVE if you shared an example of your boredom busters sheet. I second that. I’d love to hear about your boredom buster sheet. You’re such a good mom, mel! Thanks for the book ideas, we run dry around here quite often! It’s such a small world. I’m lucky enough to have Janssen for my sister-in-law and my mom got to know you when my dad was mission president in Wisconsin. I just love your recipes!